41 So those who welcomed his message were baptized, and that day about three thousand persons were added. 42 They devoted themselves to the apostles' teaching and fellowship, to the breaking of bread and the prayers. On the day of Pentecost the church burst open as a great multitude responded to the good news of Jesus. 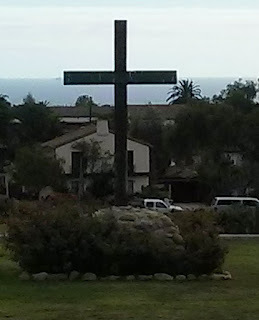 Not only did they respond to the good news of salvation, but they became a community that centered themselves around four practices - apostles teaching, fellowship (koinonia), breaking of bread, and prayers. These four practices have been preserved in Christian worship. Each plays a role in our life together. We are, as Disciples, a Table-centered Church. We gather weekly for Table-fellowship believing that Jesus is present with us at the Table. Indeed, Jesus is the host at this Table, not us, and so we seek to embrace Jesus' own eating habits, remembering that he ate with sinners and tax-collectors (among whom we are to be counted). What was once a communal meal, perhaps a potluck, in time became more ritualized. 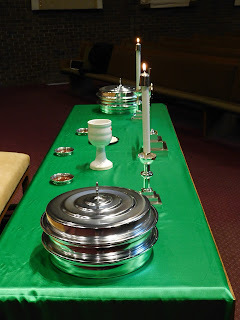 There are reasons why this occurred, but as Keith Watkins reminds us, even after the full meal disappeared, the sense of that meal continued on in ritual form as the church gathered together and shared in bread and wine in remembrance of Jesus. He writes: "Just as a birthday cake conveys the central meaning of a birthday dinner, so the bread and wine convey the central meaning of our life together in Jesus Christ: that he is the bread that comes from God so that we might be fed" [Patterns of Faith in a Table-centered Church, p. 10]. So, as we gather together-hearing the Word, sharing life together, praying (and singing), as well as breaking bread-what is happening to us? How does the idea of koinonia, of community, inform our gathering at the Table? If we scan down a few verses in Acts 2, after Luke takes note of their worship life, he speaks of the life together as community. He suggested that, at least for a moment, the community shared all things in common, and no one was in need, and "day by day, as they spent much time together in the temple, they broke bread at home and ate their food with glad and generous hearts, praising God and having the good will of all the people." (Acts 2:44-46). How then are we being formed as a people? How are we exhibiting in our life together God's new creation in Christ? How do we inhabit the realm of God in our gatherings for worship around the Table? This is the Lenten devotional for today as published in Central Woodward Christian church's 2017 Lenten Devotional. This year's devotional features texts that connect with our focus on Table and Mission, which is being supported by a Vital Worship Grant from the Calvin Institute of Christian Worship.